In 2014 a local Pittwater Club, wishing to generate fundraising to support the Women's Rugby Sevens requested this news service visit the training session of these ladies at the Sydney Academy of Sport and Recreation on Narrabeen Lagoon. This was one tough training session and these were very determined girls supported and guided by a great coach. On August 9th 2016, Tuesday morning Sydney Time, those same faces and voices appeared again, on the others side of the world, fulfilling what they had strived for and inspiring the next generation of women rugby players. These Australian women made history by winning the first gold awarded in women's rugby sevens at the Olympics with a tight 24-17 triumph over trans-Tasman rivals New Zealand at the Deodoro Stadium. "Definitely a family culture we've got going down at Narrabeen" Shannon Parry stated in a post gold medal presentation interview, "I think the tournament just shows the growth of women's rugby," she said. "Fingers crossed come 2020 (Olympics) it will be there for Tokyo as well." Parry's team-mate Emma Tonegato, who scored Australia's opening try in the final, expects women's sevens rugby to reach a new level of participation and interest, especially in Australia. "I think this is great for rugby sevens and what it can do for rugby sevens in Australia," she said. The team will now feature now feature on an Australia Post stamp. Australia Post first created the gold medallist stamps in the Sydney Olympics, designing special edition stamps for every team and individual gold medallists. The Australian Sevens will be the first rugby team to feature on the stamp, and the fourth to be confirmed at the Rio Olympics, with Kyle Chalmers (Mens 100m Freestyle stamp) Olympic Swimming, Women's (4X100m Freestyle) and Olympic Shooting, Women's Trap, Catherine Skinner already securing the Collectors eye. 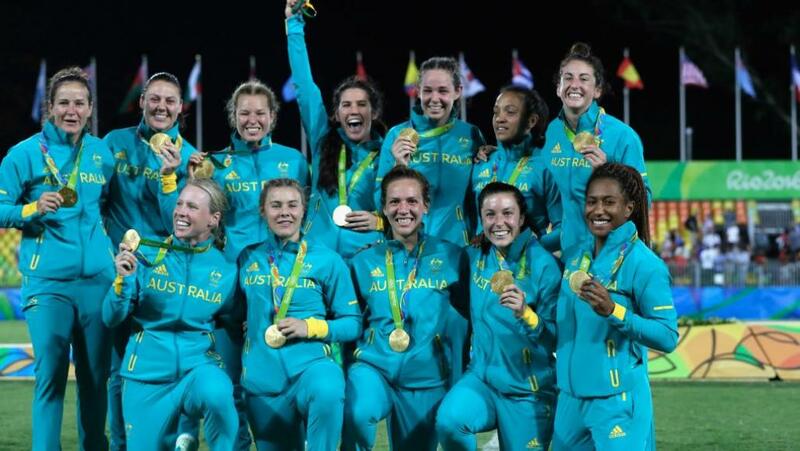 Australian Sports Commission Chair John Wylie AM has described Australia’s first Rugby Sevens gold medal as a defining moment for the further progress of women’s sport. The ASC almost doubled its high performance funding of Rugby Sevens in the four-year cycle approaching the Rio Games - to approximately $6.9 million and up 186 per cent - ensuring the new sport and its athletes had the resources to reach their potential in Brazil. AIS funding support, including direct athlete grants to female players, is based on performance and potential, so more than half of the Rugby Sevens funding was directed to Australia’s number one ranked women’s team. The AIS also provided start-up funding and support to enable the Rugby Sevens program to be centralised in Sydney(Narrabeen) in 2014. Working closely with Australian Rugby, the development of this team was on display in Rio. Wylie said Australia’s 24-17 win over New Zealand in the final was an historic moment for rugby, but also women’s sport more generally. “This was such a significant win for Australian sport and, in particular, the further progress and recognition of women’s team sports,” Wylie said. “The Australian Sports Commission has consistently been a strong supporter and campaigner for women’s sport. An historic win like this really shines an international spotlight on how brilliant our female athletes and teams are. “In recent years it has been incredible to see Australian women’s teams continue to build their profiles, led by national squads such as the Diamonds in netball, Matildas in football, Opals in basketball, the Southern Stars in cricket, the Stingers in water polo, Hockeyroos in hockey and many more. “This win is another defining moment in the growth of women’s sport. It will inspire girls and women to pursue participation opportunities and sporting pathways. I’m confident it will have grabbed the attention of the commercial world because there is merit and reward from investing in women’s sport.